Diplomas for the Second Class of MMA’s Medical Faculty, University of Defence in Belgrade, who completed integrated studies of medicine were awarded today at the Military Medical Academy. Vice-chancellor of the University of Defence, a teaching staff of MMA’s Medical Faculty, cadets, and their parents. Colonel Prof. Dr. Dragan Dincic, Deputy Head of the MMA addressed the cadets. He stated that youth is the greatest value of Serbia, and a youth of military medical doctor, according to him, is further enriched with vast knowledge. - It is up to us, if we know and if we can, to crack windows or doors to you, so that you can keep on walking without or with less attrition, or at least not to do something that will slow down your steps or diminish your strength - said Colonel Prof . Dr. Dincic. He pointed out that the Medical Faculty, together with the Military Medical Academy have become "an efficient producer of young doctors' and that he always takes the opportunity to mention to foreign delegations visiting the MMA that cadets are probably the best among the best. MMA’s Deputy Head said he was looking forward to their first jobs, their residencies and further education. Cadets were awarded diplomas, firstly to the best - Nemanja Jacimovic, with the grade point average 10.00, Jadranka Zaric with 9.98 and Jelena Katic with 9.96. 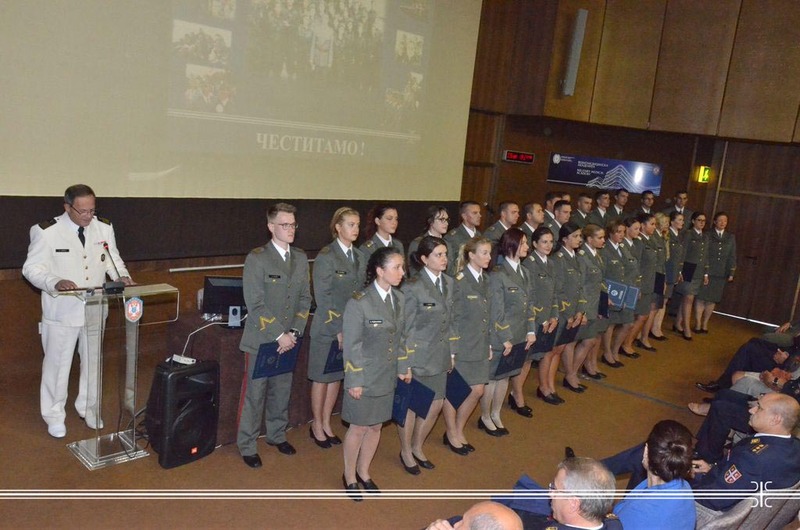 Then they took the Hippocratic Oath, after which the Dean of the Medical Faculty Col. Prof. Nebojsa Jovic addressed them, congratulating them their graduation and beginning of professional medical and military career. - All these years you've been taught, worked and lived the life of a future military doctor. You've seen what awaits you, and you were not afraid but you even more diligently fulfilled your tasks. We are proud of you because you have grown into wonderful young people, because only such can conscientiously work in accordance with the Hippocratic Oath and the Oath of Allegiance - as pointed out by Prof. Dr. Jovic. The young military doctors will be promoted to first officer rank tomorrow in front of the Serbian Parliament. Starting from this year, the best-in-class of the MMA’s Medical Faculty will be delivered a reward out of the newly established Foundation "Professor Stevan Sefer". It is an art prize - pictures by Slobodanka Rakic ​​Sefer. It was this year that she presented her picture to Nemanja Jacimovic, the best cadet of the Second Class of the MMA’s Medical Faculty.